New research by the Transparency Market Research group predicts that green building materials will be a huge market by 2015. This is not surprising given the increased credits given to avoiding toxic materials in LEED v4. The USGBC’s materials research, combined with the American Standards and Testing Materials association (ASTM) are also working on identifying materials hazardous to human health. You can read about this movement towards healthier materials here, here, here. 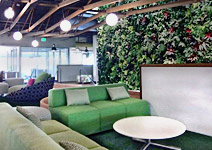 Green wall at Google helps to filter the air and provide respite for employees.